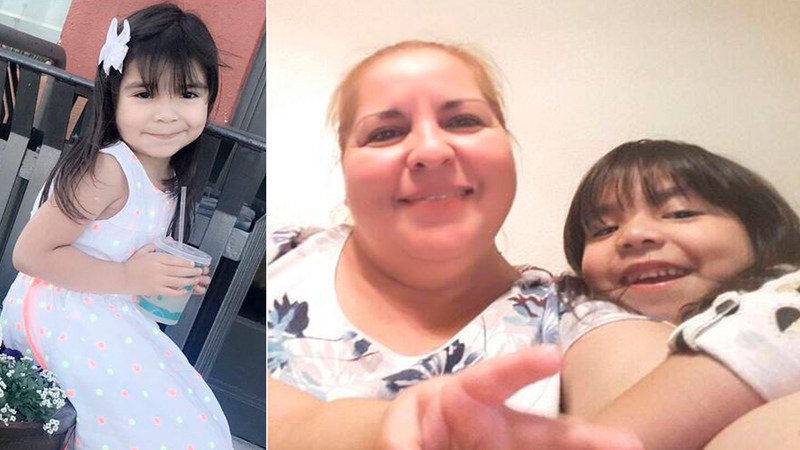 VICTORVILLE, Calif. (KABC) -- A missing 5-year-old girl and her grandmother were being sought Saturday after the woman allegedly kidnapped the child, who disappeared from a residential area of Victorville, authorities said. The victim, Aleysha Martinez-Ruiz, was last seen by her mother about 3 p.m. Friday in the 15000 block of Seneca Road, according to the San Bernardino County Sheriff's Department. At the time, Aleysha was with maternal grandmother, 51-year-old Luz Maria Garza-Ramones, who was visiting from Monterrey, Mexico, the sheriff's department said in a statement. "It is believed Luz Maria is trying to take Aleysha back to Monterrey to be with the rest of the family," the news release said. According to investigators, Garza-Ramones does not have a vehicle and may be traveling by bus. The child is described as Hispanic, 3 feet 6 inches tall, weighing 50 pounds, with black hair and brown eyes. She was wearing a white dress with a gold zipper on the back at the time of the alleged abduction. The suspect is said to be Hispanic, 5 feet 8 inches tall, weighing 220 pounds, with blonde hair and brown eyes. She was last seen wearing a red blouse and blue shorts. Anyone with information about Aleysha's or Garza-Ramones' whereabouts is asked to call sheriff's Detective Taylor Long at (760) 241-2911 or (760) 241-3180.